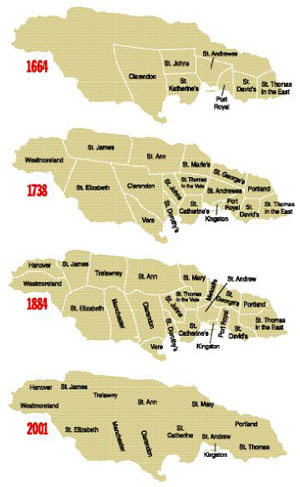 How did they come about and how did they get their names - Jamaica's parishes explained. 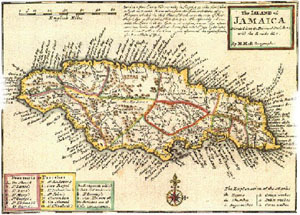 In 1664, the Spanish relinquished control of Jamaica to the British and Sir Thomas Modyford divided this fair isle into 7 administrative units known as parishes. These were located mainly in the mid to south- eastern end of the island: Clarendon, St. John's, St. Andrew's, St. Katherine's, Port Royal, St. David's and St. Thomas in the East. Within 25 years, by 1683 the number of parishes had doubled totalling 15 parishes as St. Dorothys, St. Thomas in the Vale, Vere, St. George's, St. Marie's and St. Ann's and St. James and St. Elizabeth's were added. In 1692 earthquake survivors fled across the harbour and Kingston was formed a year later. By the mid-eighteenth century parishes covered the entire island. In 1758 the island's 3 counties ­ Surrey, Middlesex and Cornwall ­ were created to facilitate more convenient holdings of courts of Justice. Surrey has 4 parishes ­ Kingston, the smallest parish, St. Andrew, St. Thomas and Portland. Middlesex has 5 ­ St. Catherine, St. Mary, Clarendon, St. Ann and Manchester. Cornwall also has 5 ­ St. Elizabeth, Trelawny, St. James, Hanover, the second smallest parish in the island, and Westmoreland. In the mid-nineteenth century, Jamaica recorded its largest number of parishes ­ 22. In 1867 some parishes were melded into others and the island was left with 14 ­ the number of parishes we have today. Each parish has a capital town and serves as a unit of local government. Kingston, which existed as a settlement of houses in the mid-1600s prior to even its formation as a town, became the capital of Jamaica in 1872. It acquired this position due to its function as a major centre for commerce and communication. The parish of St. Andrew, formed in 1867, was originally called Liguanea after the Liguanea Plain in which it lies. Since most of the other 13 parishes were named after governors of Jamaica, their wives, or English kings, it is possible that St. Andrew derived its name similarly. 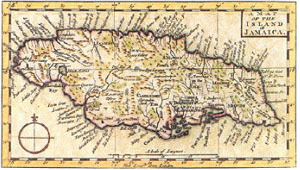 St. Thomas, for example, may have been named after Thomas, Lord Windsor, Governor of Jamaica in 1662. Portland was named after the Duke of Portland, Governor in 1723, the year of the parish's formation. Kingston was once called Beeston after Sir William Beeston who served as Lt.-Governor of the island from 1693-1700. It is not known how the parish received the name Kingston although a letter from Port Royal dated July 3, 1693 referred to it being known by some as "Kingston" and others as "killcown". Kingston was made a parish in 1713. St. Catherine, formed in 1867, was named after Charles II's Queen, Katherine, and it was once spelled as such. Charles II was king when the parish was formed. St. Mary, may have been named after the Spanish port Santa Maria, although Modyford's daughter was called Mary and when St. Mary was first formed, it was next to the parish of St. George which was named after George Nedham, Mary's husband. Clarendon was named after Cromwell, the Lord Chancellor and St. Ann was named after Ann Hyde, wife of James II. In 1814 Manchester was formed from the parishes of Clarendon, Vere and St. Elizabeth. It was named after the Duke of Manchester who was governor of Jamaica when it was formed. St. Elizabeth was named in honour of Elizabeth, wife of Sir Thomas Modyford, who was Governor when it was formed in the seventeenth century. Trelawny, formed in 1770 was named for former governor Sir William Trelawny who died in Jamaica in 1772. St. James was named for the Duke of York who became James II. Hanover, formed in 1725-26 out of parts of Westmoreland and St. James, it was named after the then reigning family in England ­ it was originally to be called St. Sophia in honour of the mother of George I but this idea was overridden. Formed in 1703, Westmoreland's name may simply come from the fact that it is the westernmost parish in the island. Each parish has unique places of interest and characteristics. St. Ann, for example, is known as the Garden Parish for its extreme beauty. The population of our 14 parishes is approximately 2.6 million people, the majority of which reside in the parishes of Kingston and St. Andrew. Sources: Bryce, W. (1946) Ed. Reference Book of Jamaica, B.W.I., Cundall, F. (1926) Handbook of Jamaica for 1926, The Gleaner (1995). Geography and History of Jamaica. 24th Edition, Our Island, Jamaica, Mike Morrissey.